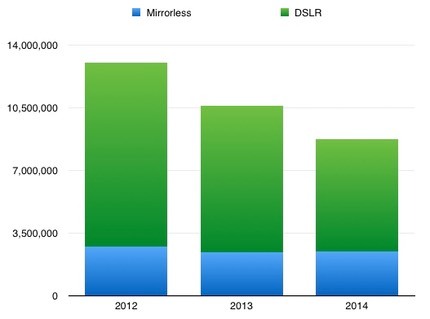 If I were at Fujifilm, Olympus, Panasonic, or Sony looking at that data, my immediate response would be: when will Canon and Nikon decide to convert DSLRs to mirrorless and attempt to marginalize us again? Given Canon’s recent projection that 2015 interchangeable lens camera sales will once again grow for them, I’d say “soon.” Real soon, as in January/February 2015 given the camera maker’s typical release schedules. Of course, it’s not at all certain that Canon and Nikon can immediately remove their mirrors and push the current (mostly) mirrorless-only players aside, but I think it’s pretty certain that they’ll try. Nikon has already tried once, with limited success once they started discounting. I suspect that just gave them more data on where they need to be with their next iteration (basically US$500-700, DX DSLR-equivalent performance, still F-mount compatible) and what it will cost them in marketing dollars to squeeze in. Canon was more tentative, as if they were really just scouting the territory. 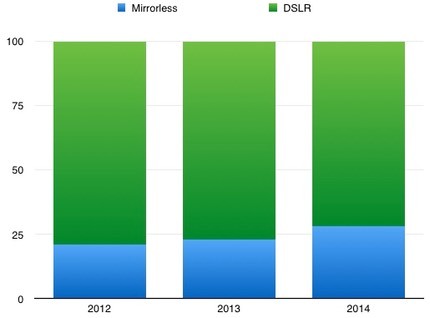 I’ve written this elsewhere, but it’s worth repeating here: just moving functionality and IQ from DSLR to mirrorless and making the camera somewhat smaller and lighter won’t resurrect the camera business. The pond is drying up for interchangeable lens cameras for a reason, and it doesn’t have to do with whether the camera has a mirror in it or not. 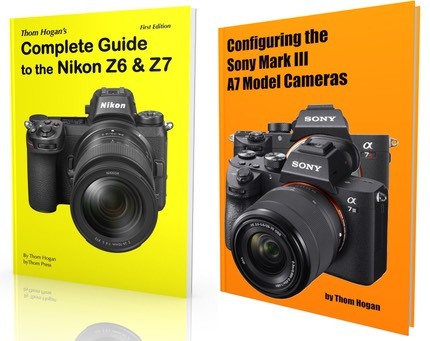 In order to restore growth in the camera business, cameras will have to have something disruptive that makes current cameras seem not so interesting any more and worth replacing. The two things I said to target in this respect back in the 00’s were: communicating and programmable (and the two really have to be done together). Just having a WiFi link is not enough. You have to solve the user’s workflow issues from beginning to end, and WiFi is just a transport mechanism, not a solution itself. And, of course, you have to effectively market the disruption ;~).